This ministry provides communications advice to the main government authorities enabling them to identify strategic needs in the moment and guide decision-making, so that they can provide coordinated support to the Executive Branch. Ms. Pérez graduated from the Universidad Andrés Bello with a degree in Law. She served as a council member for the district of La Florida from 2000 to 2010. 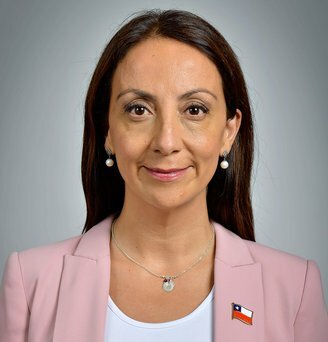 In 2011, she was appointed to the Subdirectorate of the National Women’s Service under the first administration of President Piñera, and then to the Government of the Metropolitan Region, where she served from July 2011 to November 2012. On November 5, 2012, she was sworn in as Minister Secretary General of Government, and remained in that role until March 11, 2014. She served as Cabinet Chief and congressional team leader for Congresswoman Lily Pérez from 1996 to 2004. Ms. Pérez subsequently joined the team of the Municipality of Puente Alto as Communications Director, and served in that role until 2009. She has been a member of the Renovación Nacional party for 23 years and served as its Deputy Chair (2010-2012) and Secretary General (2010). After President Piñera’s first term, she became Deputy Chair of thinktank Fundación Avanza Chile and host of the radio programs Las Cosas por su Nombre, La Gran Mañana Interactiva and Directo al Grano broadcast on the channel Radio Agricultura. She was also a panelist on the Estado Nacional show on national television channel TVN. She is the mother of two daughters, Catalina and María José. Mr. Hantelmann has a Degree in Forestry Engineering from Universidad de Chile and is a specialist in the design of public spaces for crime prevention. He served as Director of the Environment, Hygiene and Public Displays for the Municipality of Puente Alto and as a council member for that district from 2012 to 2016, winning the 2012 elections with the second highest majority of votes in the country. He is the Chairman of the Renovación Nacional party for the Metropolitan Region. Mr. Hantelmann has served as the advisor to the Transportation and Telecommunications Committee, and on environmental issues and municipal management for Senator Manuel José Ossandón. 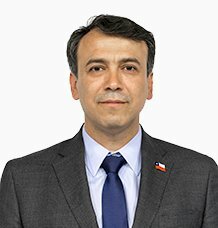 During the second round of the presidential elections in 2017, he served as Regional Manager for 14 districts in the Metropolitan Region for Sebastián Piñera’s campaign. He is married to Mónica Terrada and the couple has three children.